When the sun is out and the temperatures are rising, Chicago wakes up and it’s full of life and beauty abound. And, there’s no better season (okay, perhaps maybe summer) to get outdoors and experience the city for all its greatness. Of course you can always check out the latest exhibit at a museum or take in a show—especially on a rainy afternoon—but if it’s springtime in Chicago, you’ll definitely want to enjoy the breeze and outdoor activities as much as possible. Not sure where to start? Here’s a handy guide. Next time you’re in Chicago during the spring season, mark these fun attractions on your to-do list. Navy Pier is awesome when it’s nice and warm outside, as there are tons of restaurants, rides, beer gardens and other fun attractions to choose from in the heart of downtown. Plus, even if the sky darkens and it begins to rain, you can head into the theater for an IMAX movie. Lastly, make sure you don’t leave before hopping on the Ferris wheel—it’s a renowned hotspot in Chicago you can’t miss. Take advantage of the Lakeshore path in the spring and summer when it’s beautiful outdoors. Whether you want to take in a morning jog or run or take a Divvy bike around for a leisurely ride, there’s a super long trail (it’s as though it never ends!) that’ll help you get that distance and sight-seeing in. You can also stop along the way and look around various neighborhoods or hop off that bike for a game of ball in the park. Chicago has beautiful architecture, and there’s no better time to see the buildings than when the snow has cleared and there are flowers and a warm glow all around. Whether you choose an architecture walking tour, where you’ll head into different buildings and learn of Chicago’s culture by foot, or hop on an architecture cruise to browse along the river, there are plenty of ways to stay outside and experience Chicago’s rich history. Right in the heart of the city, Millennium Park lights up once winter passes, as there are different activities, like musical performances, dance, art shows, food festivals, and more, all of which come alive in the warmer seasons. You can grab some food and have a picnic on the steps or you can mark your calendar for set activities going on around the park. And if you have kids, you can take them to the playground or let them splash around in Crown Fountain for some family fun. 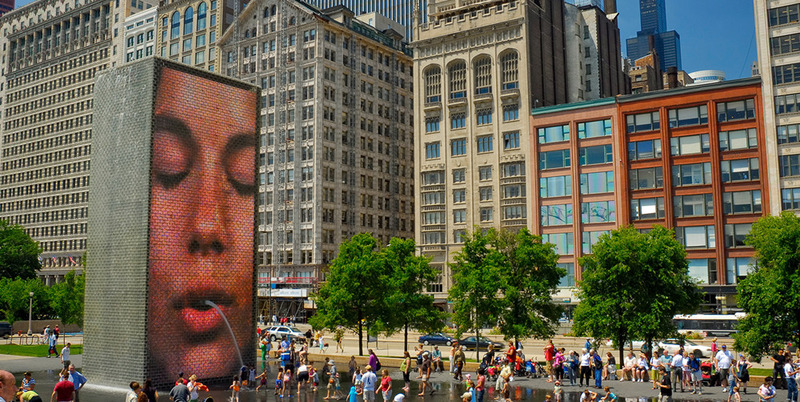 Think of Millennium Park as a hub for outdoor fun—you could literally spend hours there!